Getting a new kitchen is an exciting project. Are you looking to have your kitchen remodel completed this spring? Getting a new kitchen is an exciting project. You can finally have all of the features you’ve been dreaming about that will make cooking and hosting guests more fun. Here is some insight into what a kitchen remodel entails. Before any remodeling work can begin, you need to establish a solid plan first. 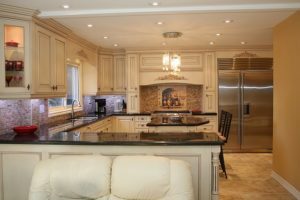 Decide on your goals and objectives for your kitchen remodel project. However, don’t fret if the planning process takes you longer than you might think. You might need several months in order to complete your plans before any actual remodeling begins. If you struggle with finding ideas for your new-look kitchen, online inspiration may help. Bring pictures and other concepts to your designer, and then it’s time to create a budget. The next step is to arrange a sensible budget. Once you have a final budget in mind, it can make it easier to settle on what you can and can’t include in your new kitchen design. Relying on budget calculating resources can help you determine what you can realistically afford, but in any case, once you have a certain budget in mind, it’s time to work with the professionals. Working with a professional will ensure your satisfaction with how your kitchen remodel turns out. The experts at About Kitchens and Baths are more than happy to help bring your gorgeous new kitchen to life. Throughout the kitchen remodel process, be sure to schedule regular updates. At the end of every week, meet with your designers and builders to see how well it is going. Another option is to meet with them at the end of a work day and see what has happened or what setbacks they have encountered. Also, while your primary kitchen is under construction, you might have to make use of an outdoor kitchen to prepare your meals. However, it might be necessary to stay with friends, neighbors, and relatives, or go to a hotel until the kitchen remodel has been completed. This entry was posted on Friday, March 29th, 2019 at 2:01 pm. Both comments and pings are currently closed.